Recombinant Human KPNA4 protein (ab114626) can be used as a positive control in WB. 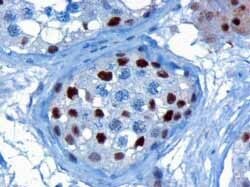 Human testis and ovary lysate. 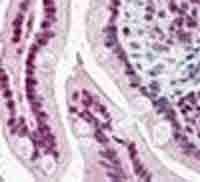 Human testis tissue sections and human small intestine sections. GenBank Accession Number – NP_002259. The nuclear import of karyophilic proteins is directed by short amino acid sequences termed nuclear localization signals (NLSs). Karyopherins, or importins, are cytoplasmic proteins that recognize NLSs and dock NLS-containing proteins to the nuclear pore complex. The protein encoded by this gene shares the sequence similarity with Xenopus importin-alpha and Saccharomyces cerevisiae Srp1. This protein is found to interact with the NLSs of DNA helicase Q1 and SV40 T antigen. Our Abpromise guarantee covers the use of ab6039 in the following tested applications. WB Use a concentration of 0.2 - 1 µg/ml. Detects a band of approximately 55-60 kDa (predicted molecular weight: 58 kDa).Can be blocked with Human KPNA4 peptide (ab23144). A customer reported that milk can significantly suppress antigen-antibody interaction on nitrocellulose membrane in WB. Functions in nuclear protein import as an adapter protein for nuclear receptor KPNB1. Binds specifically and directly to substrates containing either a simple or bipartite NLS motif. Docking of the importin/substrate complex to the nuclear pore complex (NPC) is mediated by KPNB1 through binding to nucleoporin FxFG repeats and the complex is subsequently translocated through the pore by an energy requiring, Ran-dependent mechanism. At the nucleoplasmic side of the NPC, Ran binds to importin-beta and the three components separate and importin-alpha and -beta are re-exported from the nucleus to the cytoplasm where GTP hydrolysis releases Ran from importin. The directionality of nuclear import is thought to be conferred by an asymmetric distribution of the GTP- and GDP-bound forms of Ran between the cytoplasm and nucleus. In vitro, mediates the nuclear import of human cytomegalovirus UL84 by recognizing a non-classical NLS. In vitro, mediates the nuclear import of human cytomegalovirus UL84 by recognizing a non-classical NLS. Highly expressed in testis, ovary, small intestine, heart, skeletal muscle, lung and pancreas, but barely detectable in kidney, thymus, colon and peripheral blood leukocytes. Immunohistochemistry (Formalin/PFA-fixed paraffin-embedded sections) - Anti-KPNA4 antibody (ab6039)Image is courtesy of an anonymous AbReview. Immunohistochemical analysis of 10% buffered formalin-fixed paraffin-embedded murine nephric tissue sections, labelling KPNA4 with ab6039 at a dilution of 1/100 incubated for 12 hours at 4°C. Heat mediated antigen retrival was performed through 10mM citrate buffer at pH 6.0. Blocking was with 5% serum incubated for 1 hour at 21°C. Secondary was a polyclonal Donkey anti-Goat Alexa Fluor® 647 conjugate at 1/200. Counterstain is DAPI against nuclear DNA. The Negative control is the same as above, but in the abscence of the primary ab6039. ab6039 at 0.5µg/ml staining approximately 55-60kDa band of KPNA4 in Human Testis lysate by Western blot (ECL). ab6039 at 0.5µg/ml staining approximately 55-60kDa band of KPNA4 in Human Testis lysate by Western blot (ECL). ab6039 (3µg/ml) staining Human Testis by IHC-P. Microwaved antigen retrieval with citrate buffer (pH 6), HRP-staining. 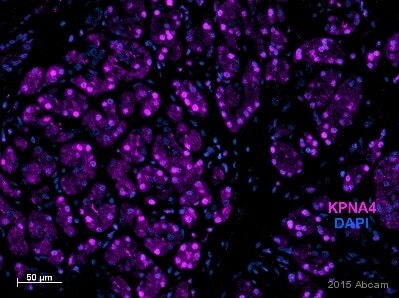 ab6039 at 5µg/ml staining KPNA4 in human small intestinal tissue by Immunohistochemistry (Formalin/PFA-fixed paraffin-embedded sections). Steamed antigen retrieval with citrate buffer pH 6, AP-staining. Publishing research using ab6039? Please let us know so that we can cite the reference in this datasheet. Thank you for your advice; we will analyse other human cell lines and will let you know the results. I am sending this email to inquire about the updates you might have about the WB analysis. There were few anti KPNA4 products that were proving difficult to use and as per your last email you were suppose to contact me with the results. I am wondering if these products are working now. Could you update me with any progress you have made? If you are still having problems then please let me know I will certainly try to find a solution of problem. Many thanks for your cooperation in this case. I will be looking forward to hearing from you soon. Thank you very much for providing the replacement antibodies. We have now tested these in Western blotting and below is a summary of the results. This antibody produces a good signal in Western blot. However, this signal is still much weaker than the signal produced by anti-KPNA2 (ab6036) (used as a positive control) (see top panels inattached PowerPoint file). Interestingly, the signal is also weaker than the signal produced by the same antibody purchased fromAbcam in September 2006 (lower panels). Overall, although it might not be ideal, anti-KPNA4 (ab6039) clearly works and could be useful in our project. This antibody produces a doublet at the expected position forKPNAisoforms (between 50-75 kDa), suggesting cross-reaction with another KPNA. In addition, it produces multiple bands at higher mol. wt. some of these as strong as the bands at the expected position. Due to the cross-reaction and the overall low signal (compared to the positive control anti-KPNA2 (ab6036)) this antibody is unlikely to be useful for our project. This antibody produces multiple bands of low intensity at positions higher than expected fromSRP1 (expected to run between 50-75 kDa). Overall, this antibody failed in Western blot and is of no use for our project. In summary, we would like to test further antibodies forKPNA6 andSRP1. Could you please recommend any alternatives and provide them as replacements? Two SRP1 antibodies failed, which is very strange. We have used SRP1 transfected 293T cells line in the characterization of antibody ab124646, this means that the 293T cells seems not expressing the protein. I would suggest using Hela cell line lysates as positive control. KPAN6: please use 293 cell line lysates, human skeletal muscle lysates or brain lysates as positive control. I am sure these antibodies will produce excellent results once correct cell line is used and with some protocol optimizations. I hope this information will be helpful. Should you have any question please do not hesitate to ask. I have discussed your recommended replacement antibodies with. We would like to try the 3 antibodies ab6035, ab6039 and ab82149 you have suggested.Thank you for all your help. I am sorry this product did not perform as stated on the datasheet and for the inconvenience this has caused. As requested, I have issued a free of charge replacement with the order number 1092038.